As the first professional studio reference headphones with Tesla 2.0 technology, the DT 1770 PRO has already made its mark in the company’s history. The DT 1770 PRO has won over sound engineers and studio users with its impressive sound quality and workmanship. Brilliant highs and a warm bass provide a perfect sound profile that is second to none. A new standard for monitoring, mixing, mastering and recording precise and powerful. 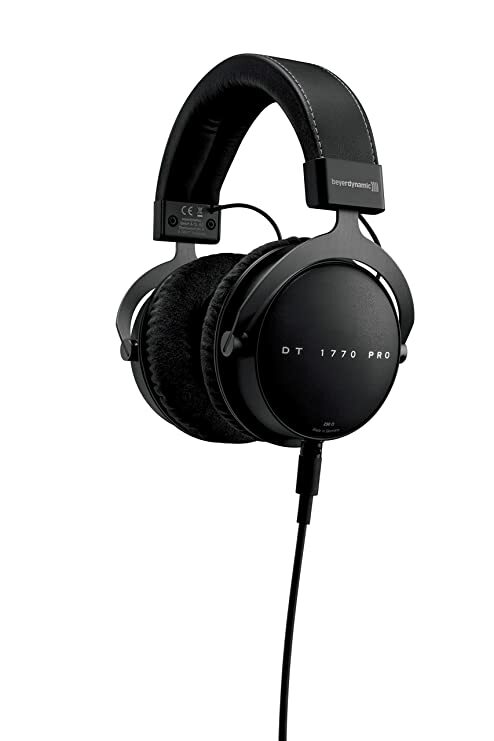 The legendary DT 770 PRO 32 Ohm from beyerdynamic is a closed, 32 ohm dynamic headphone. The Limited Edition “All Gray” model adds a fresh take to the time tested classic. The DT 770’s have proven after over 30 years of use in the best studios and sound stages around the world that they perform to the highest level every time. Designed for critical music and sound monitoring. The single-sided cable makes the handling of the headphone easy. The cushion system allows the DT 770 PRO to be used comfortably for long periods of time. The DT 770 PRO is a closed dynamic headphone of exceptional quality suitable for the most demanding professional and audiophile applications. The long term comfort and accurate performance make the DT 770 PRO the perfect monitoring headphone for recording studios, post production or broadcasting situations. The low mass coil and diaphragm assembly produce a transient performance equaled only by electrostatic earphones, and, in combination with a carefully tailored frequency response offer a natural and balanced sound. Soft ear pads and adjustable, sliding, earpieces together with a single sided connecting cable ensure listening comfort during extended periods of use. The DT 770 PRO features 32, 80 or 250 ohm drivers and a gold plated 3.5 mm stereo jack with 1/4″ inch adapter, and is therefore suitable for use with almost all headphone amplifiers. The sound of the DT 770 Pro is without a doubt a benchmark for professional users. It’s secret lies not only in our cutting-edge drivers; which are hand-made in Germany, but also in a very sophisticated bass-reflex system. The membrane can “breathe” in an otherwise closed housing and is therefore extremely quick and precise in its response, accurately replaying frequencies anywhere between 5 to 35,000 Hz. This makes the DE 770 Pro an ideal tool for critical listening and monitoring purposes. The DT 880 PRO is a reference-class, semi-open studio headphone which combines all strengths of open, transparent headphones with those of more powerful, closed headphones. Specially designed housings and an improved system equalization turn this remake of the studio classic DT 880 into an ideal studio monitoring headphone, with analytical qualities. Soft ear pads and adjustable, sliding, earpieces together with a single sided connecting cable ensure listening comfort during extended periods of use. 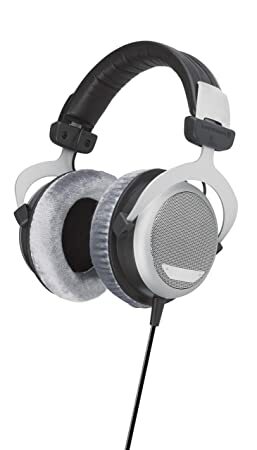 The DT 1350 80 by Beyerdynamic is a closed supraaural headphone that stands out from the crowd, delivering a professional, timeless quality that is both attractive and durable. A combination of highly efficient ambient noise reduction and an impressive maximum sound pressure level (129 dB) makes the DT 1350 80 an ideal compact over ear headphone for audio engineers, musicians and DJ’s. Regardless of whether you are a sound engineer monitoring PA systems, a live musician or a DJ, the DT 1350 80 delivers every time. The Tesla drivers offer an enormous degree of efficiency with extremely low levels of distortion, allowing the DT 1350 80 to produce a perfectly balanced, analytical sound even at the highest volumes. The removable ear cushions, combined with a flexible split headband design ensure the headphones sit securely and remain comfortable even during prolonged periods of use. The swiveling ear cups (90) also allow “single ear” monitoring. Since 1924 Beyerdynamic has remained a German family owned company committed to continuous research and innovative developments for the audio market. 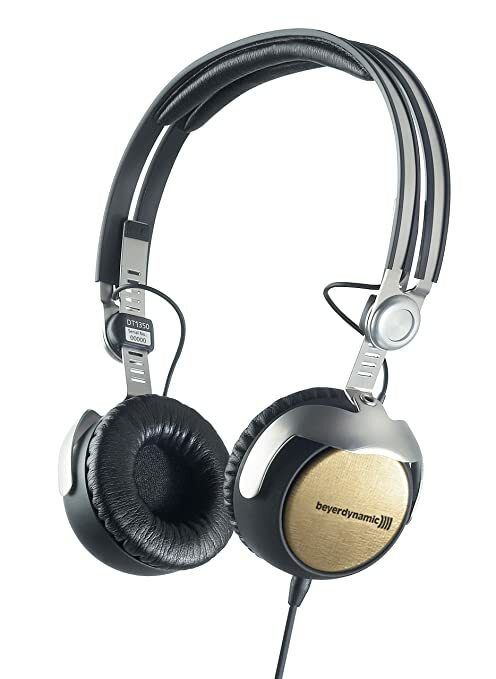 All over the world, Beyerdynamic is known for the use of the latest technologies and a high quality standard. All Beyerdynamic products are made in Germany. Beyerdynamic’s DT 770 M 80 is a closed dynamic headphone designed especially for drummers and FOH monitoring live on stage and in studios, providing excellent isolation against ambient noise. The included single sided 10 foot connecting cable is equipped with an in line volume control for optimum set up. It is fitted with a gold plated mini stereo plug with a 1/4″ adapter and is suitable for use with almost all headphone amplifiers. The rugged headband construction gives the headphone a very secure and comfortable fit, along with mechanical reliability. The soft skin ear pads are easy to clean and adjustable, and the sliding earpieces ensure listening comfort during extended periods of use. The DT 770 M 80 provides a natural, balanced sound with exceptional quality suitable for the most demanding applications. Since 1924 Beyerdynamic has remained a German family owned company committed to continuous research and innovative developments for the audio market. 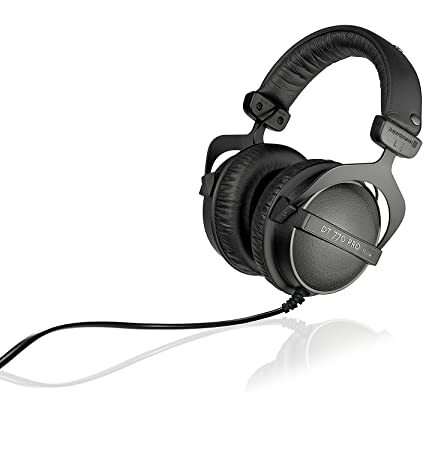 All over the world, Beyerdynamic is known for the use of the latest technologies and a high quality standard. 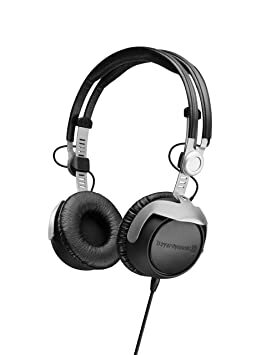 All Beyerdynamic products are made in Germany. High Definition made in Germany. 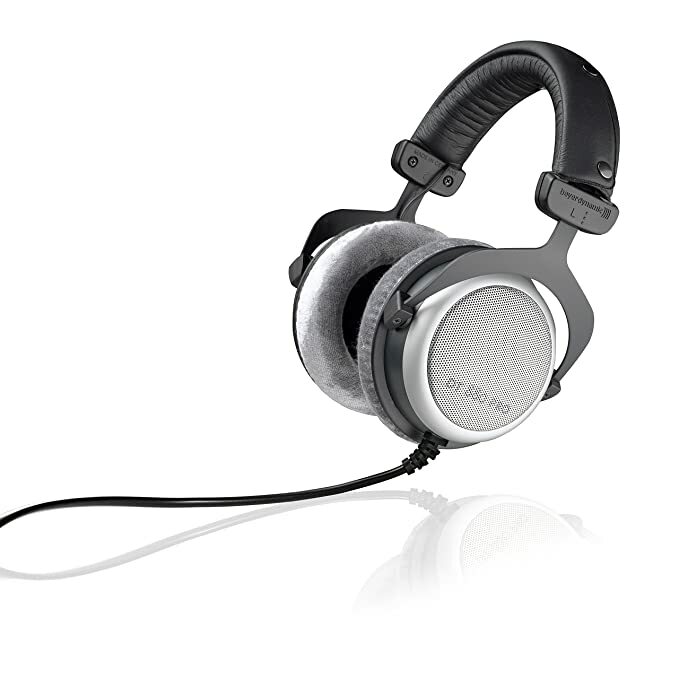 The open designed DT 990, one of the classics from beyerdynamic that have set the standard for reference headphones. The superior craftsmanship captures the dynamism and excitement of the audio signal like no other. Three dimensional acoustics and an unrivalled level of wearing comfort to satisfy the most discerning audiophile – high end made in Germany! The beyerdynamic Consumer headphones range includes superior high end headphones for discerning HiFi enthusiasts at home. The DT 990 with its lamella optics will be an eye-catcher for fans of sophisticated designs. This high end product represents beyerdynamic’s tradition to combine superior audio quality with state-of-the-art material and perfect workmanship. The distinctive headband features a high comfort and the modular construction allows replacement of all serviceable parts including the ear pads. Impedance is 250 ohm. The DT 990 includes a gold vaporised mini stereo jack plug (3.5 mm) and 1/4″ adaptor (6.35 mm). The DT 990 is also supplied with a high-quality carrying case. 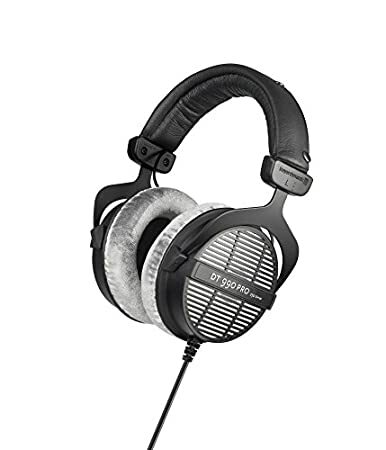 All beyerdynamic headphones include a 2 year parts and labor warranty serviceable in the U.S.A. Frequency response- Dynamic , Nominal SPL – Open, Nominal impedance- 5 – 35,000 Hz, Nominal headband pressure- 96 dB , Weight without cable – 250 ohm, approx. 2.8 N, 9 oz. In a marked departure from traditional beyerdynamic headphone design, the striking aesthetics of the re-newed DT 1350 make it stand out from the crowd, delivering a professional, timeless quality that is both attractive and rugged. A combination of highly efficient ambient noise reduction and an impressive maximum sound pressure level (129 dB) make the DT 1350 an ideal compact over-ear headphone for audio engineers, broadcasters, musicians and DJs. Regardless of whether you are a sound engineer monitoring PA systems, a broadcast engineer monitoring recoreded sound, a live musician or a DJ, the DT 1350 delivers every time. The Tesla drivers offer an enormous degree of efficiency with extremely low levels of distortion, allowing the DT 1350 to produce a perfectly balanced, analytical sound even at the highest volumes. The removable ear cushions, combined with a flexible split headband design ensure the headphones sit securely and remain comfortable even during prolonged periods of use. The swivelling ear cups (90) also allow single-ear monitoring. The DT770PRO (32 ohms) is a closed dynamic headphone for professional use as a monitoring headphone in studios or on the move. The 32 ohm version of the DT 990 Premium line. Excellant choice for MP3 and iPod/iPhone use as well as robust enough for home audio and PC applications. Handcrafted in Germany, the DT 990 is a perfect combination of design and function. This headphone features a true sound definition with phenomenal bass response and the open design. Play music the way it was intendedThe DT 990 is an open dynamic headphone of exceptional quality and suitable for all music styles; whether you are into pop, classical or jazz, the DT 990&rsquo;s will deliver the true sound as it was originally intended to. Natural and balanced soundThe reduced weight of the diaphragm and moving coil result in a similar pulse characteristic as electrostatic headphones, and in combination with a carefully tailored frequency response provide a natural and balanced sound.Uncompromised comfortSoft ear and headband pads together with a single-sided cable ensure listening comfort during extended periods of use. The DT 990 is still manufactured in Germany providing an excellent quality. 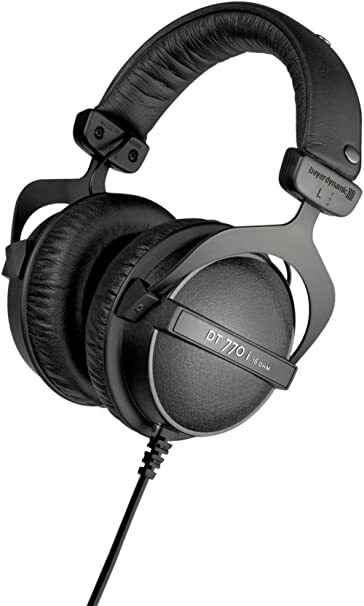 DT 770 i Headphones. The phrase Studio standard is thrown around far too often when describing recording gear. That phrase has never been more accurate than when describing the DT-770 by Beyerdynamic. 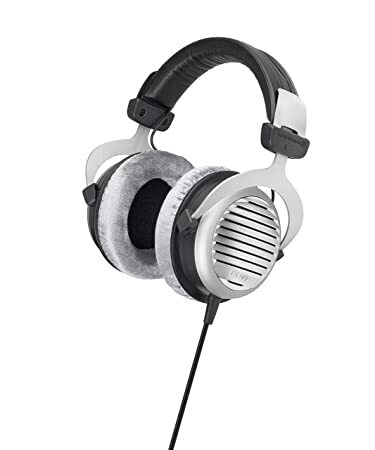 Beyerdynamic invented the dynamic headphone 90 years ago, and the DT-770 has been a studio standard, closed-back headphone for over 30 of those years. 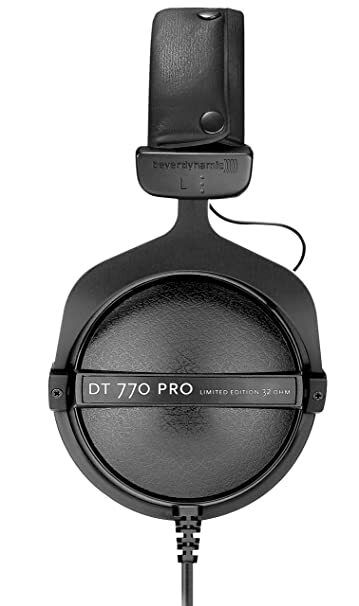 The DT-770 is a tracking headphone. It has high isolation to keep what’ playing in your headphone in your headphone and out of your microphones. The isolation is also to keep outside sounds out of your monitor mix. The huge bass and crispy highs are there to inspire your performance throughout every session. Since these are professional, handmade in Germany tools, every part including the headband, cable, and earpads can be replaced, ensuring a life-long investment. 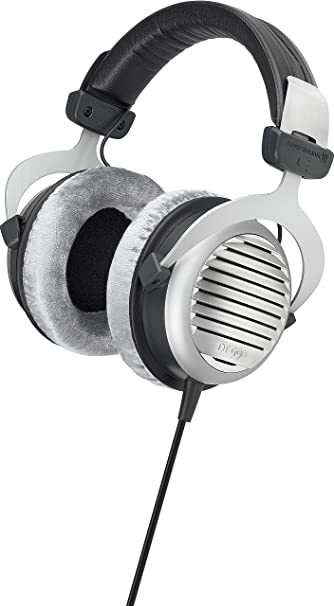 The DT-770-i is the same sound, build quality and legacy headphone but a version at a lower impedance (16ohm) designed specifically to play loud on mobile recording devices such as smartphones, tablets and associated interfaces. beyerdynamic is one of the few brands to have addressed this fast growing market by engineering a legendary studio standard headphone to work perfectly with this generation of recording devices. 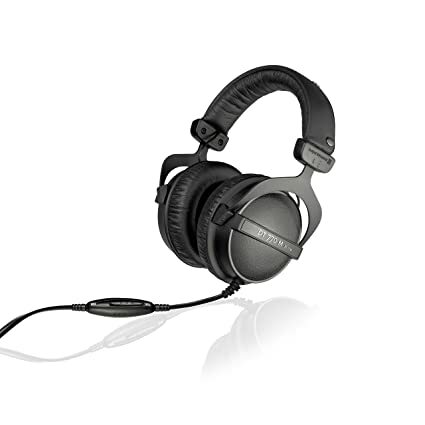 The DT-770-i is designed to take your studio standard headphone experience on-the-go. The DT 990 PRO (250 ohms) is an open dynamic headphone that is ideal for professional use in studios.